What a great team and office. Denise P.
Dr. Soondar is great! Very good bedside manner and gives you several options for treatment! Bill H.
Do you know enough about your foot and ankle problems? Healthmark provides links to information you can use. Where Do I Begin With Type 2 Diabetes? The American Diabetes Association is an excellent source of information for those with type 1 and type 2 diabetes. 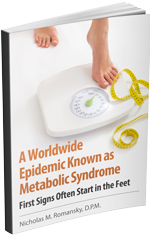 This specific link is great for anyone recently diagnosed with type 2 diabete. So if you, or someone you know has recently been diagnosed with type 2 diabetes this is a great place to begin educating oneself about living with the condition. Amputation? Kidney Disease? Nerve Damage? Just a few things caused by diabetes. Check out this quick, little article. The National Diabetes Information Clearinghouse (NDIC) provides a wealth of background knowledge on the risks of acquiring diabetes and the steps that you can take to lower those risks. The Scleroderma Foundation: What is scleroderma? Here is a good introduction to scleroderma. Much of the terminology and words associated with he disease are addressed and explained here. Vitamin D deficiency can be found in both women AND men. Many men don't consider that they could be experiencing the adverse effects of vitamin D deficiency. Here is an article discussing chronic pain with men who lack vitamin D.
Vitamin D Council: Am I deficient in vitamin D? The Vitamin D Council is a nonprofit organization providing news and information about vitamin D deficiency. Here is a simple understanding the symptoms of vitamin D deficiency. 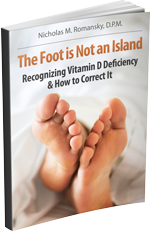 From the Nutrition Journal, the information presented here is a little more technical, but answered many questions regarding symptoms and treatment for vitamin D deficiency. Interested in trying CrossFit? Are you an on-going “CrossFitter?” Here is an article by Dr. Romansky and Dr. Flannery on understanding and preventing injury while practicing a CrossFit workout and lifestyle. No matter what the season is, small changes in your running habits can help you become a stronger, circumspect runner. It's very normal for people to get warts on their feet and between their toes. What's not normal is when people don't go forward and treat them properly. To better understand warts of the foot, read this very helpful article on treating plantar warts by doctors Christina A. Weber, DPM, and Kristine M. Hoffman, DPM featured in Podiatry Today. Whether you're a triathlete, a soccer player, a runner, or a full time parent, back pain can happen from all sorts of activites. Cheack out this article for preventing lower back pain. Lyme Disease is agrowing concern for all people throughout the United States. Outside magazine provides 9 tips for avoiding and treating tick bites. Sports injuries are often preventable and easy to protect oneself from. Check out this website for some helpful information on how you or an athlete you know can develope better practices in preventing sports injuries. These foods look like the body parts that they positively affect. Are you on your feet all day? Maybe you work retail, or in a resturant, or on a constuction site. Here's a way to prevent work-realted injuries if you find yourself standing on the job. Pain in the feet and knees are linked to the popular Ugg-style boots. A warning to consumers. The dangers of having foot surgery simply to improve the appearance of feet are revealed by orthopedic surgeons and other foot specialists. Quick tips for getting ready to hit the trails. Foot care is even more important when you are hiking. Why shoes may not be the best for your children’s feet. A study of how a child’s foot develops and the benefits of going barefoot.